Four years into the jam sessions at the “new” hotel that defines this part of the world, it’s a standing-room-only crowd. But you can still get a dance with Whitey. The beating heart of Buffalo, Wyoming, and arguably of Johnson County, isnâ€™t only found in a school, church, town hall, museum or courthouse. Youâ€™ll also find it in an 1880-vintage hotel and 1908-era saloon, in downtown Buffalo. Every Thursday night in the Occidental Hotel bar, musicians young and old, local and from far afield, jam together playing bluegrass, folk and country music. â€œMost jams among musicians last a month or two, and then they fizzle,â€ said David Stewart, a professional songwriter and co-founder of the Bluegrass Jam, which celebrated its fourth anniversary on Oct. 15, 2010.
â€œThe first time we got together in a corner of the Occidental Hotel bar, there were maybe five people in the audience,â€ Stewart said. Now on many Thursdays, the bar is standing-room-only, with people spilling out onto the sidewalk of the historic hotel. The musicians are loyal. 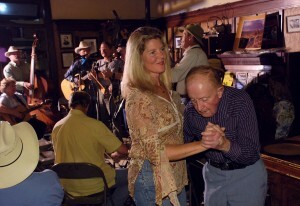 Charlie Firnekas, 75, a Kaycee-area rancher, is the oldest of the original founders of the jam. Every Thursday, he drives 73 miles one way (25 miles on a gravel road) to get to the jam and play guitar. Winter blizzards have never held him back, and heâ€™s missed only a few sessions. The audience gives back. There are tips, used to help needy families with rent or send an aspiring high school student to college for a music education. There are things people bring from home, like baked goods, fresh country eggs or handmade birdhouses. Everyone in the audience is given a numbered ticket and drawings are held during the jam. Even if a winning ticket isnâ€™t drawn, first-time visitors usually win fresh-baked cookies or other prizes. But to get a feel for the town, go to the Thursday night Bluegrass Jam at the Occidental. Each Thursday, the jam opens at 7 p.m. with â€œWill the Circle be Unbroken,â€ and closes at 11 p.m. with â€œAmazing Grace.â€ In between, almost anything can and does happen. Tourists wander in, figure out whatâ€™s going on, and dash out to retrieve a guitar, banjo or fiddle from their car and jump right into the jam. Musicians from Denver, Billings, Rapid City and beyond will drive to northern Wyoming to play in the jam. About the only rule is no instruments that would overwhelm the others, said Lynn Young, another co-founder of the jam. â€œNo drums or electric guitars,â€ he said. About every kind of stringed instrument is brought to the jam â€“ bass, guitar, dobro, autoharp, mandolin, banjo and fiddle. Oh yeah, and smokinâ€™-hot harmonicas. Stewart said he hoped no one ever shows up with a Hawaiian ukulele â€“ doesnâ€™t quite fit the whole bluegrass, folk and country thing.